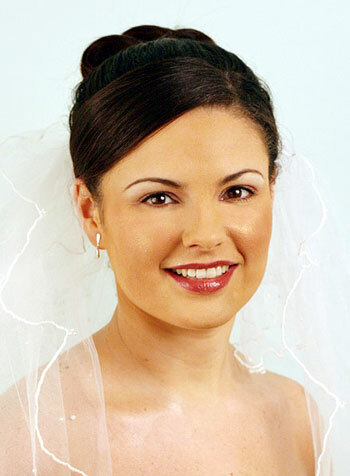 Whether it's loose and lovely or sleek and sophisticated, one of the most popular choices for bridal hair is the bun. If you've always thought the bun was too severe a look, or associated buns with ballerinas and austere school marms, think again! "This classically knotted hairstyle gets an update from various influences in fashion, film, and other sources of popular culture. 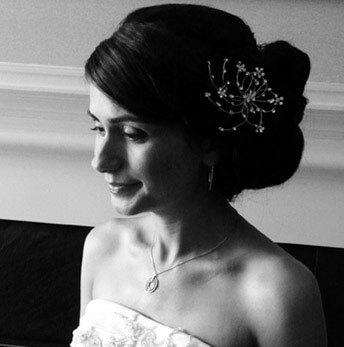 Following are examples of bridal buns to suit every style.".. 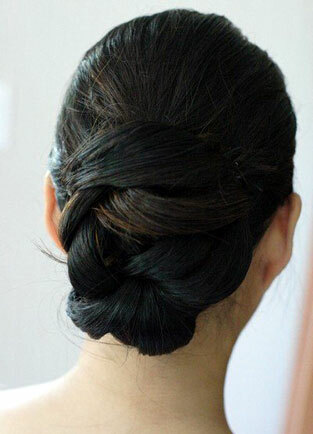 Intricately crisscrossed locks create a woven look to this bun. The bride's highlights and lowlights also add texture, which is expanded by taking stray strands from the periphery of the original ponytail and pulling them smoothly across the bun, securing underneath with pins. What makes this bun distinctive is its elongated shape and the volume of hair at the crown, which creates a retro-inspired look. This style can be created with super-long hair, with extensions, or even with shoulderlength hair if you have a skilled hair stylist who can do a lot of careful pulling and pinning. A detailed comb at the side also creates a stunning finishing touch. This 60s-inspired 'bouffant' bun tops the bride's head like a crown of glory. An intentionally tousled texture gives a modern update and adds extra height. Like the High and Tousled bun, the hair is piled on top; however, its sleek and shiny finish makes it a perfectly distinct style for the high-fashion bride. A slick pompadour bang and a bun in the back make for a standout style on your wedding day. The rocker bun is hip, fun, and not for the demure or ultra-traditional. Gently cascading tendrils at the temples create a relaxed, romantic look to this bun. If you want something that's not too severe but still sophisticated, this style is a perfect option. 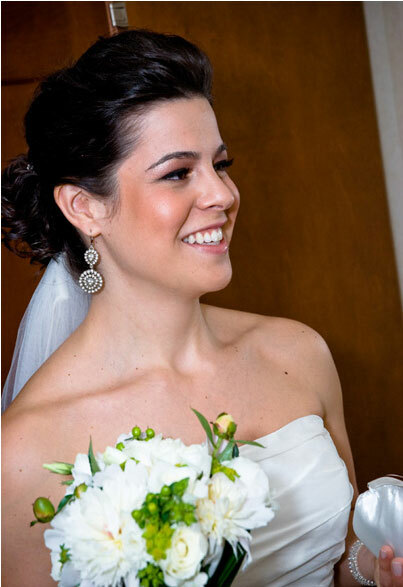 Here we have one of the most classically beautiful bridal buns, gathered low at the nape of the neck. This one, however, features a modern twist – a flower pinned at the side for an added exotic touch. This high bun with a sleek side part creates a breathtakingly regal look. Like Audrey Hepburn's updo in Breakfast at Tiffany's, this bun is visible from the front, as it peeks over the crown of the head. 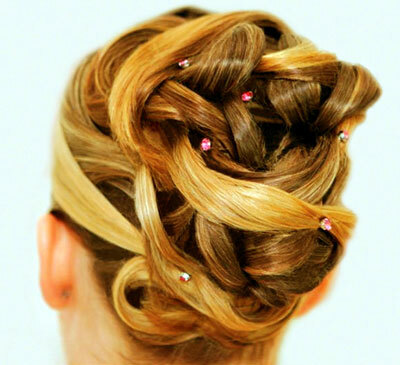 Lusciously layered locks showcase the tiny crystals embedded in this intricate bun. Highlights and lowlights also add depth, and create the visual effect of piled ribbons. Unlike the strudel bun, the overlapping tresses in this style are shaped into a more uniform ball shape, characteristic of the classic bun. 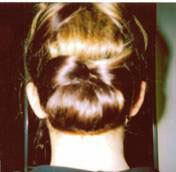 Thick sections of a ponytail, secured at the nape of the neck, are overlapped and secured with pins. Like the crisscrossed bun, the creation of this intricate style involves separating strands from the periphery of the ponytail and pinning them under. However, the strands in this style are much thicker (about one third of the bun itself), which creates the effect of "ribbons" tied neatly in a bow.